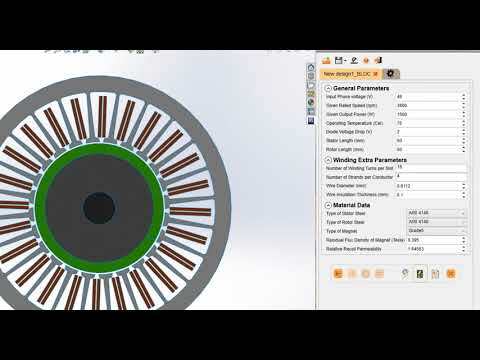 MotorWizard is a template-based motor design software. It allows SOLIDWORKS users to build multiple conventional and hybrid rotational 3D and 2D machine designs. It makes the adjustment and the investigation of the type and the size of the machine flexible and easy by giving access to a wide range of customizable dimensions and parameters that fully define the design. Equipped with integrated analytical and finite element-based solvers, the process of motor design becomes readily effortless and quicker. MotorWizard is an advanced CAD tool providing a flexible parametrization panel that gives access to an available wide range of templates’ sketches and features. Thus, it transforms the 3D and 2D SOLIDWORKS assembly into a fully defined electric machine. Different motor designs can be generated by customizing the default templates. Permanent Magnets Brushless DC and Switched Reluctance motors are supported with many types and shapes of rotor and stator parts. The topology editor turns the complex machine design into an easy and quick process with the auto-correction feature that computes adequate dimensions based on the selected configuration. The initial performance prediction is a crucial step in motor design tests; thus, based on wisely defined approaches, instantaneous calculations of the design characteristics can be processed in few clicks. By entering the Quick Calculator input data, multiple steady- state results can be viewed and analyzed such as: Torque waveform, Air gap flux density, Back EMF, winding flux linkage, phase inductance, Co-energy, Core losses, etc. Electromagnetic machine behavior can also be accurately predicted through the 2D Finite element-based analysis (FEA) where different test-oriented results can be obtained. Alternatively, the model can be generated in 3D version to be coupled to EMS for advanced and more intricate motor simulation and analysis including electromagnetic, thermal and structural analysis. In MotorWizard, FEA simulation can be performed for different machine operating conditions such as No-load and Full-load. MotorWizard offers a user-friendly interface that makes the management of the created machine designs intuitive and optimized. Multiple analyses can be carried out in a short time and restoration of previous design specifications is always permitted, which make the optimization of the machine design quicker and very efficient.